Pharmacokinetic analysis of antibody-drug conjugates (ADCs) requires characterization and quantification of both the antibody-conjugated cytotoxic drug molecule (acDrug) as well as the antibody vehicle, among other analytes, in order to assess the safety and efficacy of ADCs. Due to the complexity of biological matrices, immunoaffinity capture is widely used for enrichment of the biotherapeutic, followed by enzymatic or chemical release of the drug and LC-MS/MS analysis to provide the concentration of acDrug. This bioanalytical strategy has been used successfully with ADCs, but is limited to ADCs having cleavable linkers. Herein, we developed a sensitive and specific method that involved subjecting the ADC to tryptic digestion, and measured a peptide that included cysteine conjugated to the drug to provide quantification of acDrug. Using this method for a THIOMAB™ antibody-drug conjugate (TDC) conjugated to MMAE via a cleavable linker, valine–citrulline, we compared peptide-linker MMAE data from the new assay format with earlier MMAE data for acDrug. 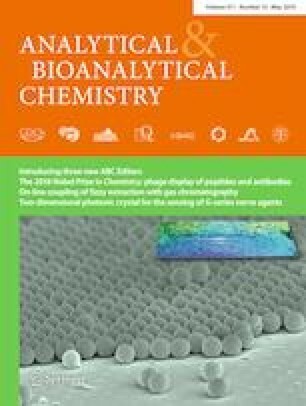 This showed that the new assay format provides robust acDrug as well as total antibody concentration to study in vitro stability of the TDC in multiple matrices and in vivo pharmacokinetic models of TDC in rat and mouse. The data from the two orthogonal modes of acDrug analysis showed good agreement with each other, allowing us to successfully quantify acDrug to study the stability in vitro and the pharmacokinetic parameters in vivo. This new assay strategy allows acDrug quantification for ADCs with non-cleavable linkers where the resulting acDrug analyte is a peptide-linker drug. The online version of this article ( https://doi.org/10.1007/s00216-019-01701-9) contains supplementary material, which is available to authorized users. The authors would like to thank Michelle Schweiger, Nina Ljumanovic, and Roxanne Andaya for their support in conduct of animal studies. Additionally, Patricia Siguenza is acknowledged for reviewing the paper. The authors state that they have obtained appropriate Institutional Review Board approval or have followed the principles outlined in the Declaration of Helsinki for all animal experimental investigations. All of the authors are employees of Genentech. The authors have no other relevant affiliations or financial involvement with any organization or entity with a financial interest in or financial conflict with the subject matter or materials discussed in the manuscript apart from those disclosed. Peters C, Brown S. Antibody-drug conjugates as novel anti-cancer chemotherapeutics. Biosci Rep. 2015;35. https://doi.org/10.1042/BSR20150089. Hao P, Ren Y, Alpert AJ, Sze SK. Detection, evaluation and minimization of nonenzymatic deamidation in proteomic sample preparation. Mol Cell Proteomics MCP. 2011;10:O111.009381. https://doi.org/10.1074/mcp.O111.009381.